TORONTO—The Canadian Opera Company made a stunning season debut on Oct. 6 with Verdi’s comic masterpiece “Falstaff.” The opera—light, energetic, and with great depth—was the composer’s last in a career that produced 28 operas. When it premiered at La Scala in Milan in 1893, the composer was almost 80 years old. Verdi had initially hesitated taking on the project, fearing that with his old age the opera might remain incomplete. Yet he soon accepted the challenge, eager to present one more work to the public. Verdi faced many challenges during that time, including the death of good friends, but while sadness pressed him, he managed to carry on, writing a beautiful melodious score to accompany the fine libretto by fellow Italian Arrigo Boito. It was the latter’s idea to create the opera, which he adapted from Shakespeare’s comedy “The Merry Wives of Windsor,” featuring the rambunctious character of Sir John Falstaff. Boito also drew from the playwright’s two Henry IV plays where the large gentleman was also a character. 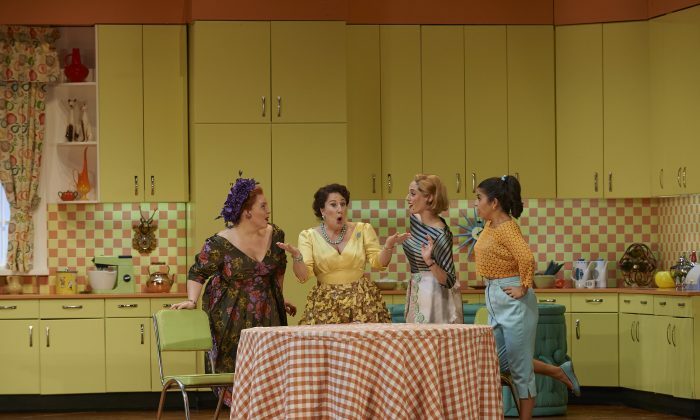 In the COC’s production, “Falstaff” comes to vivid life, blending qualities a good opera should have: a masterful score, high calibre cast, memorable story, and an engaging set design. The production succeeds on all counts, with renowned Canadian bass-baritone Gerald Finley as Sir Falstaff leading a talented group of Canadian singers that includes baritone Russell Braun as the jealous husband Ford, soprano Lyne Fortin as his wife Alice, and mezzo-soprano Lauren Segal as Meg Page, Alice’s friend. The singers’ enthusiasm and joy for their roles exuded from the stage into the audience’s hearts. The opening night performance ended with a well-deserved standing ovation. The 1950s setting of this adaptation was a pleasure to watch—from the costumes to the sets—which almost gave the feeling of watching a contemporary theatrical play uplifted by beautiful melodious passages. Indeed, the opera stays fresh and engages the audience throughout. This is due in part to its enduring quality, which manages to speak as much to contemporary audiences as it did to generations past, but also to the sensibility of director Robert Carsen and his creative team in staying true to the essence of the story while re-imagining it for the modern day. The opera’s plot is a farcical one. Sir Falstaff, an impoverished, oversized aristocrat with a remarkably good opinion of himself, sets out to conquer two wealthy married ladies. He sends them identical letters, which the women, being good friends, share with each other, enthused at receiving loving attention from a noble suitor. After realizing they have been duped (in a wonderful musical moment), the two women set out to teach Sir Falstaff a good lesson in humility. The rotund gentleman does indeed fall into their trap and is made a good fool of. Yet the exuberant Sir Falstaff is only briefly confounded by his situation. After a few moments of self doubt, he joins in their laughter, coming to the conclusion that it was none other than his own wit that inspired the others’ witty actions. If he is a fool, well, so are all the rest. The opera concludes with what may be a lesson from an aging Verdi who has come to gain wisdom from a long life—the world is a joke, and all men are fools. Coming from a man whose rich repertoire of operas has included mostly tragedies, it speaks as a reminder that life should be taken more lightly. Perhaps it is due to this insight that a character such as Sir Falstaff—indolent, gluttonous, disloyal—continues to be loved hundreds of years later and has inspired such great music.